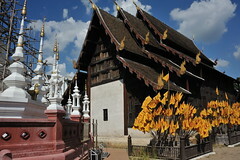 Chiang Mai a city situated in northern Thailand has been nominated by Travel And Leisure magazine as one of the world’s best cities to visit for 2013. Chiang Mai has been awarded and is among the top 10 best travel cities in the world as revealed by the Travel And Leisure magazine. Bangkok retained the top spot in Travel and Leisure’s 2013 World’s Best Travel Awards readers’ survey. Other cities making the list include Istanbul, Florence, Cape Town, Kyoto (Japan), Rome, Barcelona, Paris and Chiang Mai at the 10th position. There are also a few surprise inclusions in this list including Charleston in South Carolina, which depicts that a list of the world’s great destinations will always be subjective. time laid back or traditional. They claimed it is the only place in the world where you can go to a coffee shop but still find Thai traditional food or spend the night clubbing and still hang out with monks. Another reason this city scooped this position is due to its unique culture, and unique customs. The magazine also expressed that the city is currently undergoing giant developments. Other reasons expressed by the Leisure magazine include. • There is a unique art and live music scene you will not find in any other a provincial city. • The city has numerous magnificent gold trimmed temples which are all still active within the old city walls. • The city is relatively affordable with the rent for a three-bedroom house with a garden being less than 400 Euros a month. • Their delicacies are amazing – you will hardly have a bad meal in Chiang Mai. • The friendly locals who have not tired of tourists and are very welcoming. True to the above Leisure and Travel magazine assessment, Chiang Mai is a wonderful place to visit for a host of reasons: The old city is a magnificent area to wander around and explore the ancient temples and hidden sois. You can enjoy some of Thai’s delicacies from a roadside restaurant. As you further explore the city, you will soon find out that Chiang Mai is a modern city, which has not abandoned its traditional culture and customs. From the trendy shopping centers and cafe culture of Nimmanhaemin to ancient temples of the old town district, Chiang Mai is a city where modern and ancient seamlessly co-exist. People from the largest cities of Asia come to Chiang Mai on a regular basis, and flying seems to be the most convenient choice. From Bangkok to Chiang Mai people travel by plane – as a matter of fact, this route is one of the busiest ones for the Thai Airways. Air Asia is another Asian airline that transports passengers from Bangkok to Chiang Mai at highly affordable prices (little over 1,500 baht, adding the fees for seat reservation and luggage). However, if you book your flight several weeks in advance, it can be even cheaper. Speaking of domestic flights, the Bangkok Airways are also a popular choice in terms of air travel, and this is a great choice for those who want to travel on a budget. Other options that link Chiang Mai to the city of Bangkok include Nok Air or the Thai Airways mentioned above, the latter being one of the most expensive options. However, the Thai Airways also link Phuket to Chiang Mai. On the other hand, there are international flights that link major cities from Asia to Chiang Mai. For instance, the Air Asia links Kuala Lumpur to Chiang Mai, while the Cathay Pacific is a great choice for those who live in Hong Kong and want to get to Chiang Mai. China Airlines connect Taipei to Chiang Mai while the Korean Airlines have weekly flights from Seoul to this Thai city. The Chiang Mai airport is conveniently located close to the city center (a couple of kilometers away) and foreigners can choose cost-effective airport transfers – they can either choose buses that take them from the airport to the city center for a very low sum, or they can opt for an airport taxi that cost a bit more but they are faster and can bring you from the airport to Chiang Mai in 10 minutes. If you want to know how to travel to Chiang Mai without spending 1,500-2,000 baht on flights, then you should know that traveling by bus is another possibility. Basically, there are two major bus stations in Chiang Mai, and people come here mainly from Bangkok (from the Northern Bus Terminal). The journey is more cost-effective compared to traveling by plane, as it can cost 10 times less but it lasts around 12 hours. There are 1st class buses or VIP buses that take people from Bangkok to Chiang Mai. After reaching the bus station, tourists usually share a ride to town to save more money. 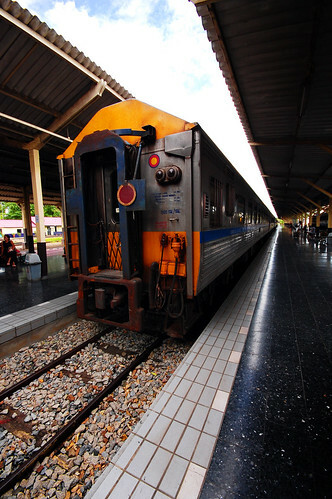 When it comes to reaching Chiang Mai by train, it must be mentioned that there are two types of services that connect Bangkok to Chiang Mai: there is the daytime train that leaves early in the morning and reaches the destination in more than 12 hours time, and there is the overnight train where travelers can opt for first-class compartments or second-class beds. There are around three or four trains that leave Bangkok daily to go to the city of Chiang Mai. Booking can be hazardous as it’s often full. For the French here is a web site offering previous train reservation.